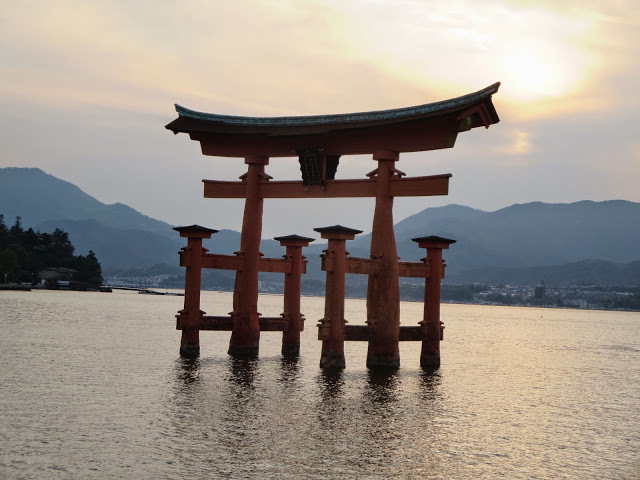 Well, any visit to Japan is incomplete without visiting Hiroshima so that’s where we headed today. 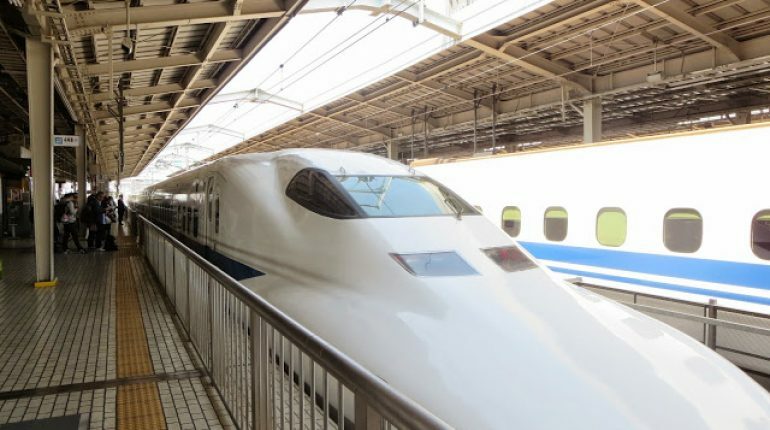 Hiroshima is about 330km west of Osaka but thanks to the super fast Shinkansen which is a train that goes up to 250 km/hr, it only took about an hour and a half to get there. Of course the super fast train had a super high price tag – 10000 yen ($100) each way. 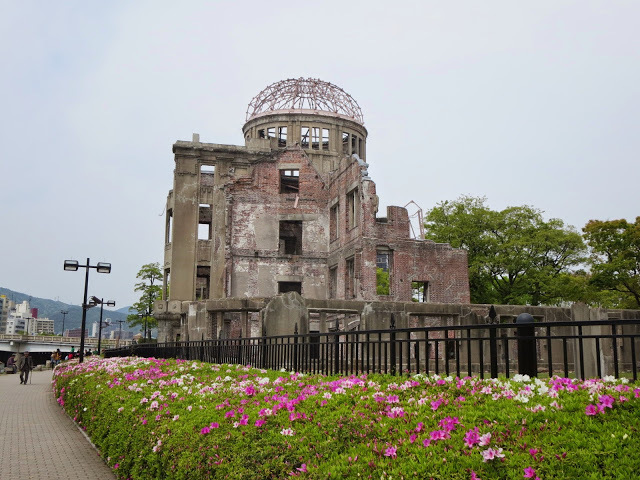 But in the scheme of things I couldn’t miss out on Hiroshima so I just bit the bullet and shelled out the money. We arrived in Hiroshima just after noon and went from the Shinkansen straight onto a cable car leading into the city. First we stopped at the Atomic Dome which was at the epicenter of the bomb drop back in 1945. It’s also one of the very few buildings that wasn’t completely obliterated. 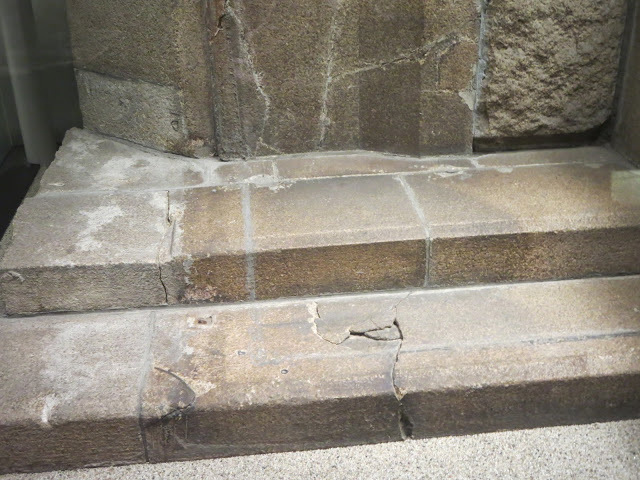 The building hasn’t been rebuilt and just simply reinforced over the years – kept that way as a peace memorial for people to visit and reflect. You can’t enter the building, just simply walk around it and view it. 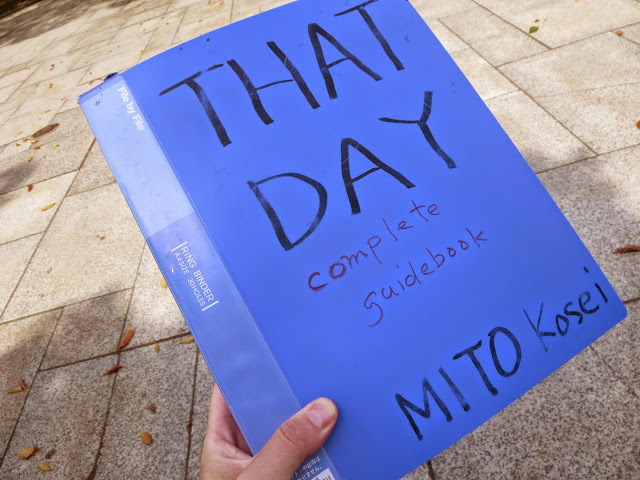 There is a man who setup information books and photos along a fence next to the building and I browsed through one of his binders titled That Day for quite a while. 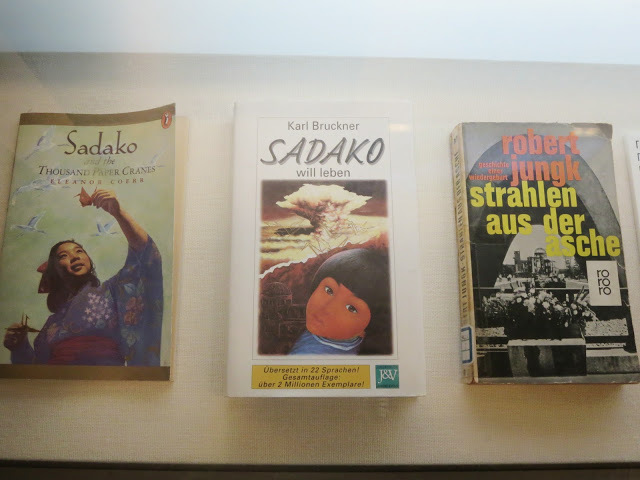 The reading was a good prelude for our next stop – the Hiroshima museum. On the way to the museum we passed through Peace Park. In the park there is an eternal flame, a somber bell for us to ring, and the Children’s Peace Monument. 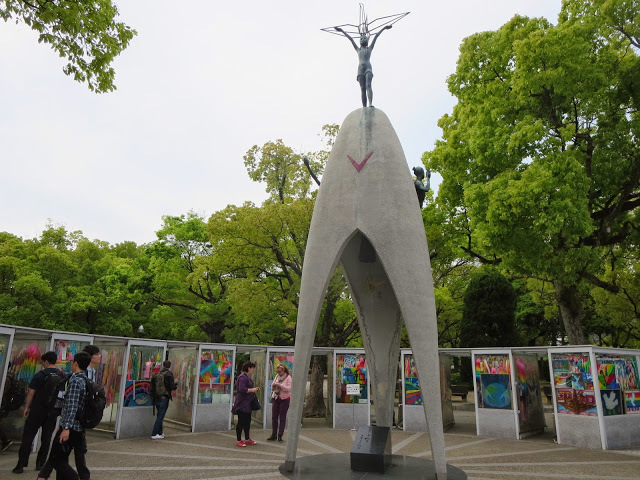 The peace monument was put together in honor of Sadako Sasaki – a girl who was 2 years old when the bomb dropped and ended up dying 10 years later from Leukemia contracted from the radiation poisoning she was exposed to. 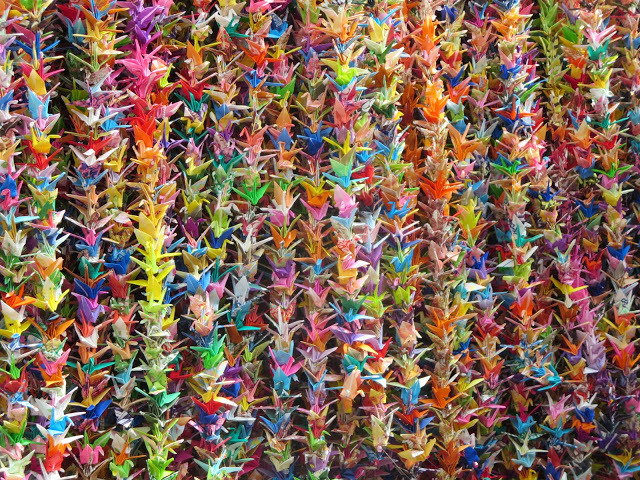 During her stay in the hospital in the last year of her life she spent countless hours folding origami cranes as she had heard if you made 1000 of them you were granted a wish. Thousands of cranes later, as much as she wished for it, leukemia finally took her but it did leave a legacy. Now at the monument there are thousands of paper cranes folded and left behind from people around the world. 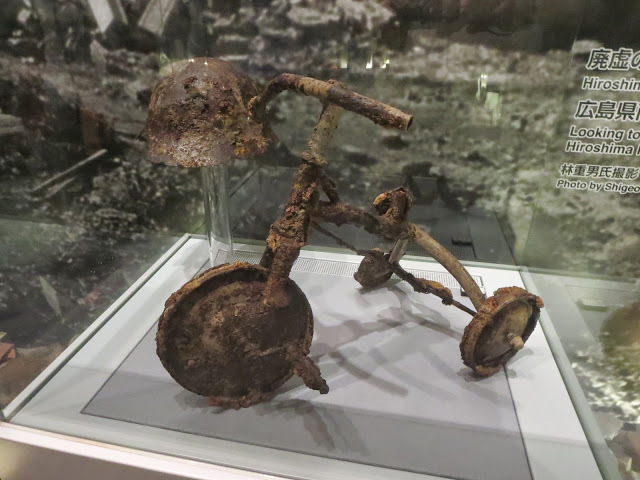 After taking some time taking in the beauty of the memorial, we took the short walk over to the Hiroshima Museum. Normally I’m not big into museums but when the subject matter is so profound, I take a very keen interest. We spent over 2 hours inside reading alot about the history of the events leading up to the bomb drop and the fallout from it afterwards. 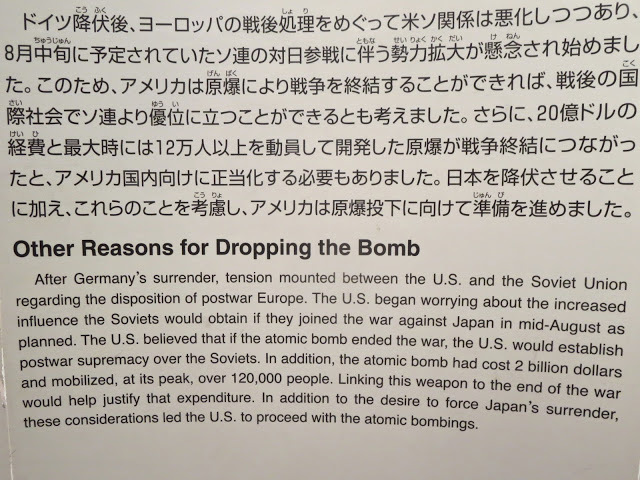 I found it particularly interesting that the decision to drop the bomb was ultimately perpetrated by the USA’s need to take credit for ending the war beating the Soviet Union to the punch and also their need to justify the two billion dollar price tag attached to creating the bombs. 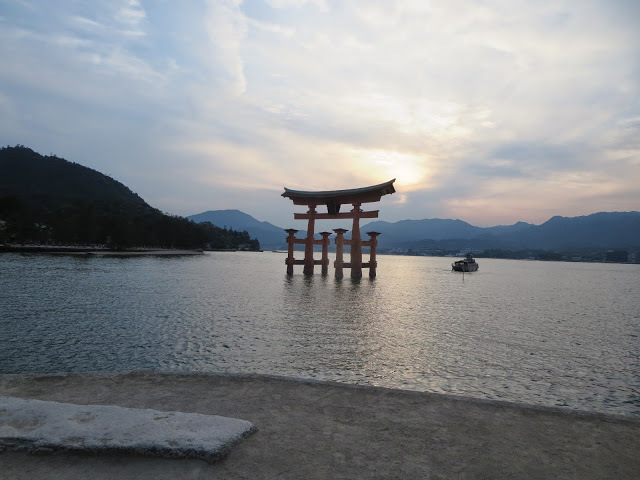 It was 4pm when we left the museum but we still had one more stop here in Hiroshima – Miyajima Island. When Ben said there were deer roaming free that was enough for me to go. Yeah, there was a shrine too but, for me, it’s always about the animals. It took quite a while on the cable car to get over to the ferry for the short trip to the island. We arrived around 5pm which turned out to be just about the right time as the tourists had thinned out and we got to walk along the seaside taking in the beauty as the sun was lowering in the sky. 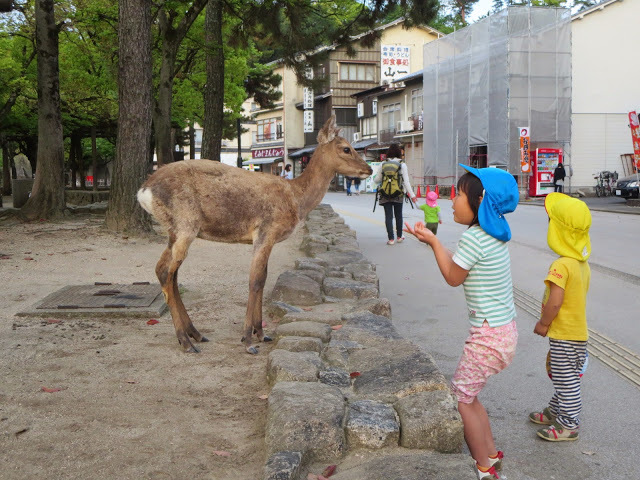 The deer indeed did roam free and were so tame with the people that you could walk right up to them without them even having a thought of running away. 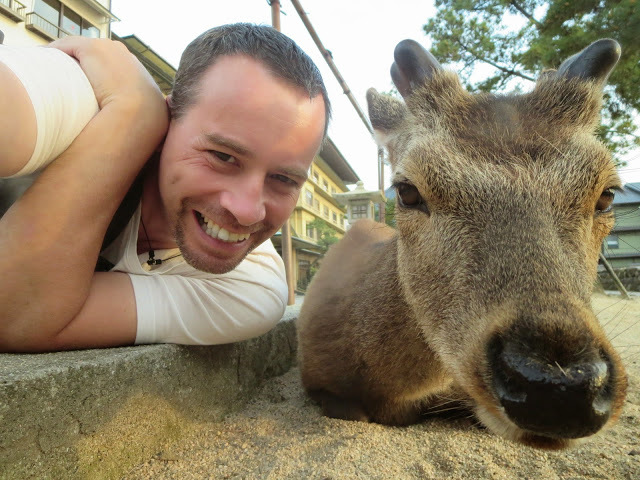 Because of that, my selfie with the deer was alot easier than the monkey selfie I took earlier in the week at the Batu Caves in Kuala Lumpur. The island pretty much closes down after 6pm as all the shops and restaurants were closing their doors. 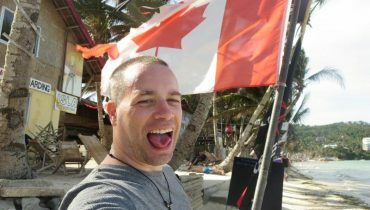 It was time for us to leave as we still had a bit of a trip back home ahead of us and we were kind of hungry and the choices for food on the island were greatly evaporating as everything was closing. We took the ferry back into town and went to the train station and bought a ticket for a train leaving for Osaka in 20 minutes. 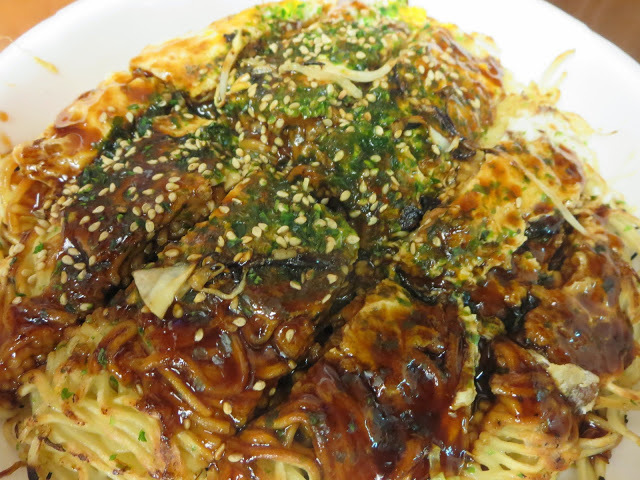 Just enough time to grab some Hiroshimayaki which is an crepe of egg/noodle and meat grilled in front of you. I was thinking about how to describe it but it’s really hard – it’s basically a sandwich where the filler is sprouts, puffed rice and bacon and the “bread” on one side is a crepe and the other side is an egg. 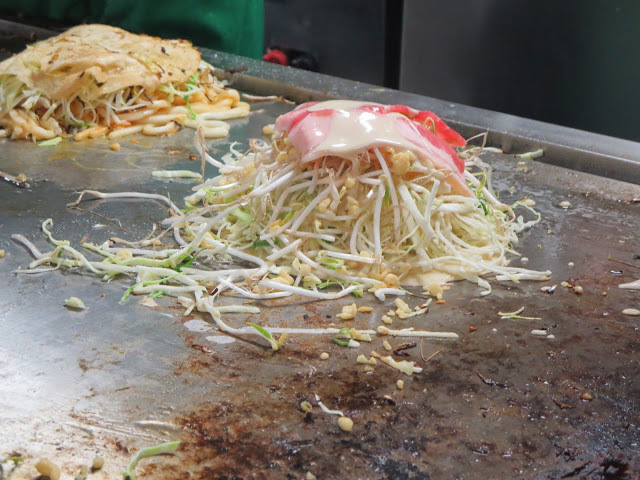 First they start with a crepe and then top it with bacon, noodles, puffed rice and bean sprouts. 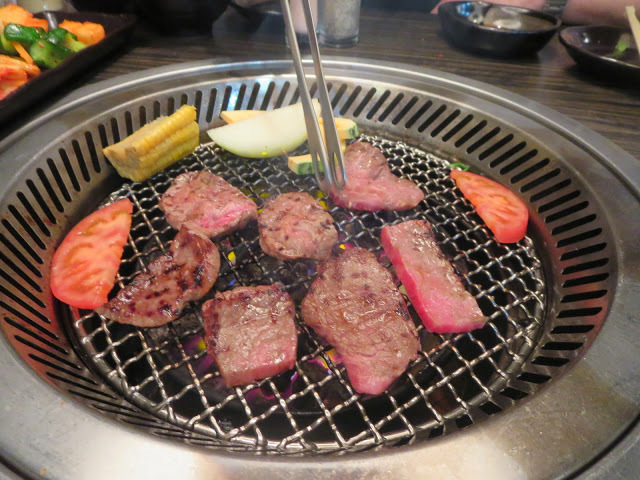 Once it’s all grilled, they flip it over onto a freshly cracked egg and then coat it in a bbq sauce and slice it up into pieces for you. 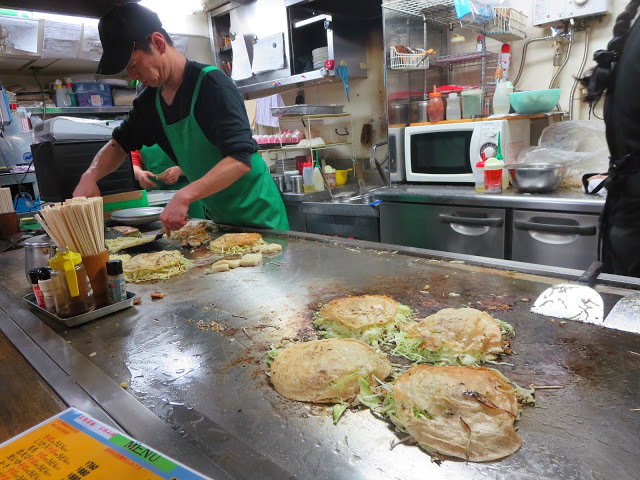 We got two of them – one to eat on the train and another to bring home to Yuka. 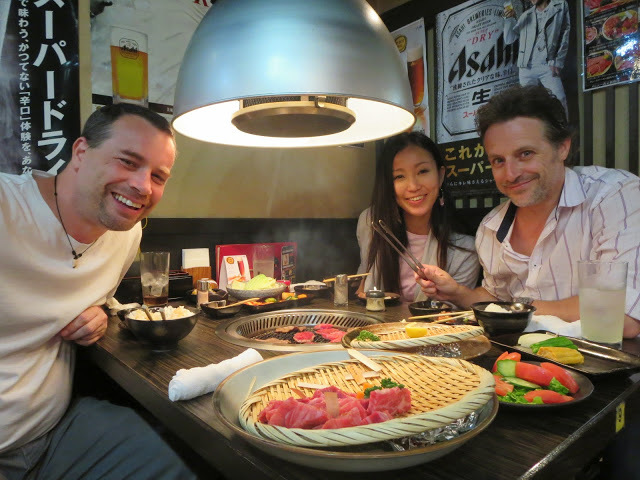 We wanted to only eat a little to tide us over til our real dinner when we got back to Osaka. Our train left at 8:20pm and we arrived back home around 10pm. 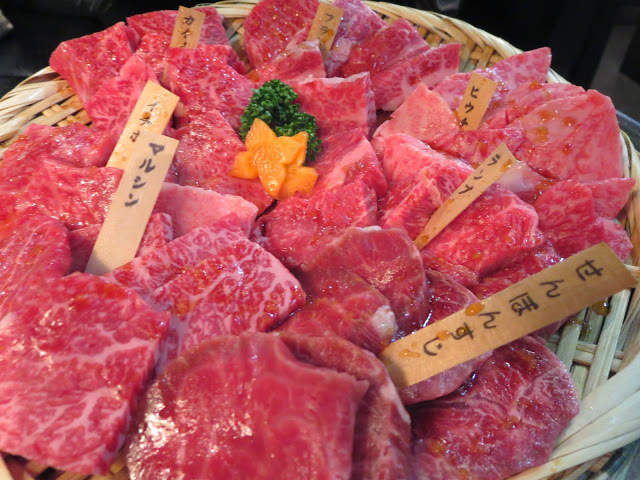 We picked up Yuka and all went down the street to a Yakiniku restaurant which is a place where you choose different cuts of thinly sliced beef to grill yourself. 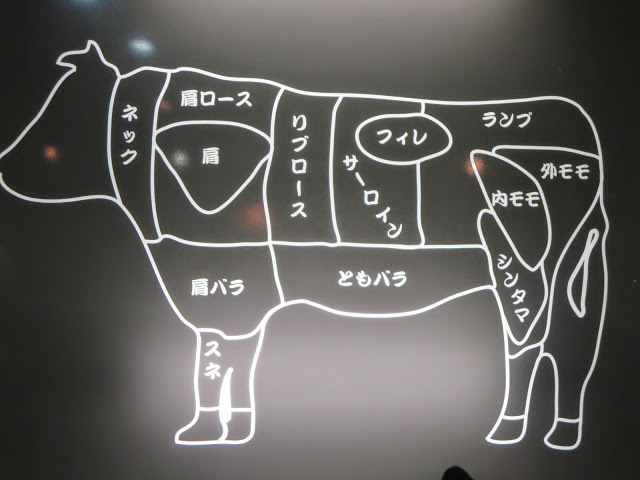 As with everything else we’ve had in Japan, it was non stop pointing at and ordering from the menu. It’s nice to get back into I don’t care how much this meal is going to cost, I’m just going to enjoy it, dammit mode. 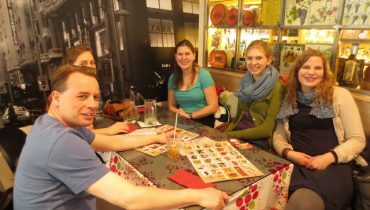 We ate until our bellies said no mas! and it was time to call it a night. It was a long day and alot happened. It actually felt like 3 different days rolled into one. See you in a week Vancouver!